Fast, accurate, and durable, the Canon imageRUNNER 400 is designed to handle most any job that comes to it. Using the latest digital technologies, the imageRUNNER 400 is able to process many different documents virtually simultaneously. 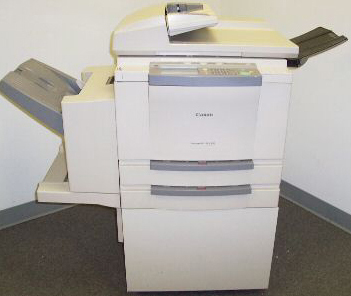 It offers 1200x600 dpi resolution (supporting 256 shades of gray), several on-line finishing options (including multi-position stapling and collating) a 7,650 sheet paper capacity, and 40 copies per minute speed to ensure that the demands placed on it are handled accurately and quickly. Prints short run digital documents including custom letters and variable data forms/statements.